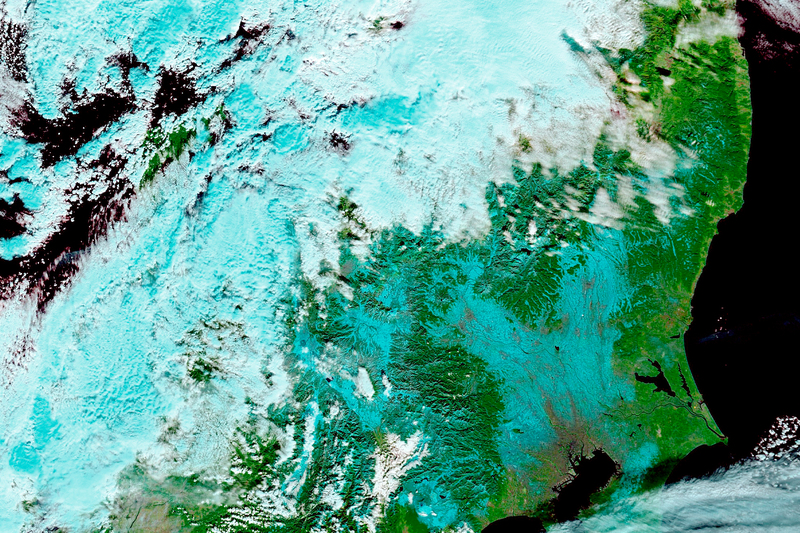 The second, false-color image from Terra shows a stark contrast between snow (blue) and clouds (white). 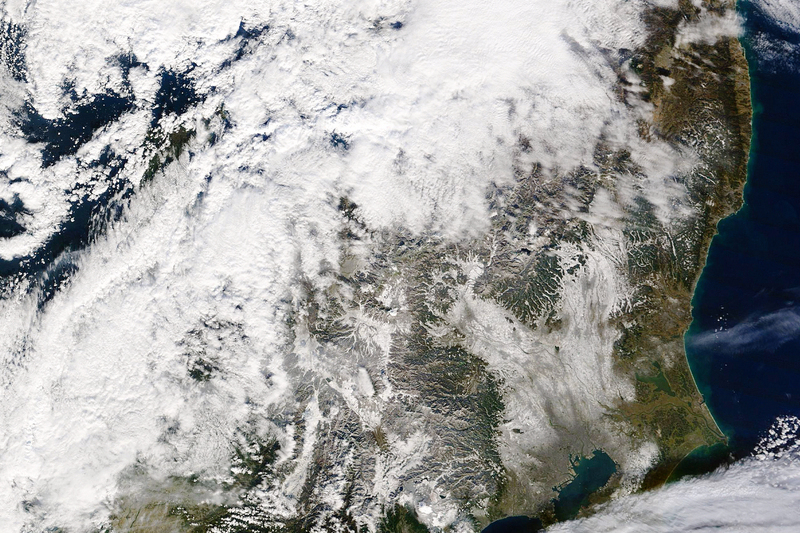 The snow traces the contours of surrounding mountains and is distinguishable from clouds offshore. 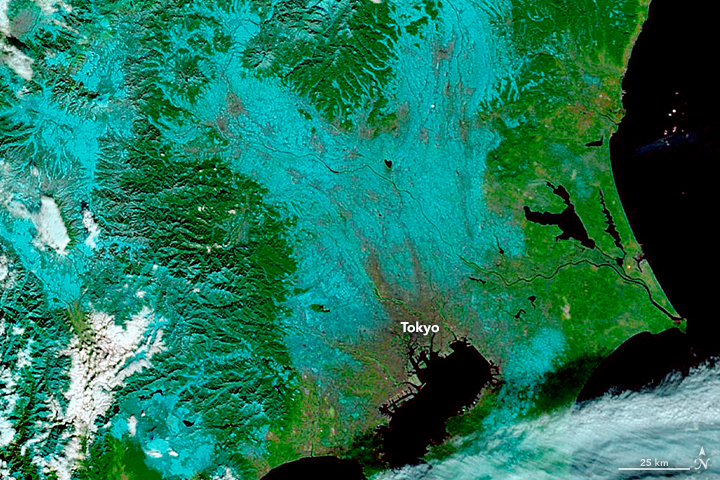 Central Tokyo is gray-brown in color, suggesting less accumulation or faster melting. 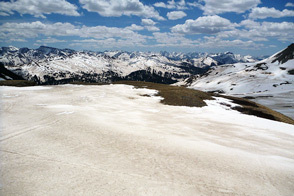 Urban centers tend to shed snow faster than surrounding countryside because they are often hotter, a result of the urban heat island effect. 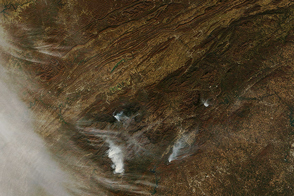 The November dusting was caused by a cold air mass moving down from the Arctic, according to the Japan Meteorological Agency. Meteorologists connected the storm to the Arctic oscillation, a climate pattern that affects the northern hemisphere. Usually, high air pressure in the mid-latitudes prevents colder, low-pressure air seeping down from the Arctic. However, weaker pressure systems occasionally disrupt this barrier, and colder air can penetrate further south, as in this case. Central Tokyo is more gray than white, suggesting less accumulation or faster melting. NASA Earth Observatory (2010, December 17) Arctic Oscillation Chills US and Europe. 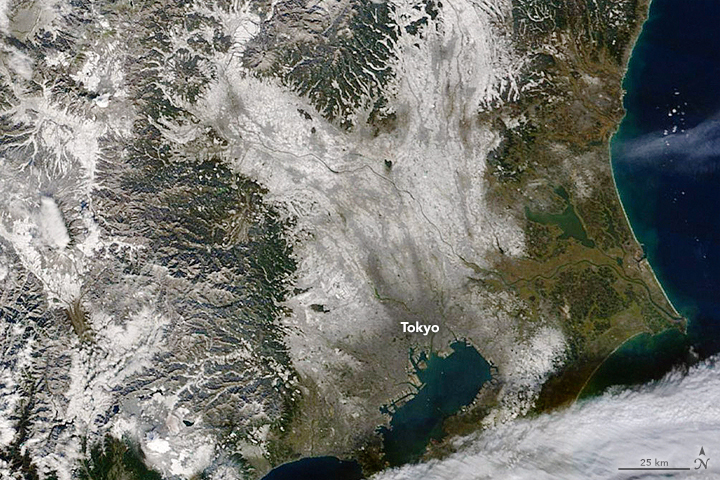 NASA Earth Observatory (2006, January 25) Rare Snow in and Around Tokyo. 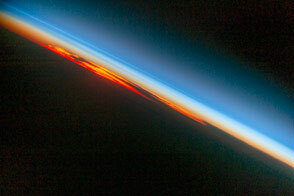 NASA Earth Observatory Urban Rain. USA Today (2016, November 24) Snow Falls in November for First Time in 54 Years. Accessed November 28, 2016.